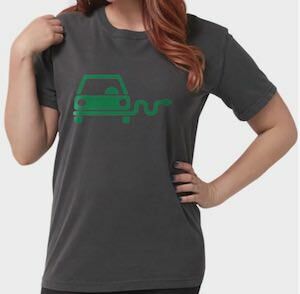 Now you can tell people to think about EV’s by wearing this green electric car t-shirt. You can get this shirt in styles for men, women, and kids and it comes in many colors and sizes. On the t-shirt you can see a green car with an electrical cord coming from the back so that it is ready to charge when you need to. By now everyone knows that electric cars are better for the environment and a green car will get that message across. Wear this t-shirt often so that people will think about getting and electric car if they are in the market of replacing their old car.